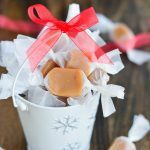 I first shared this recipe on Lil’ Luna where I am a contributor. 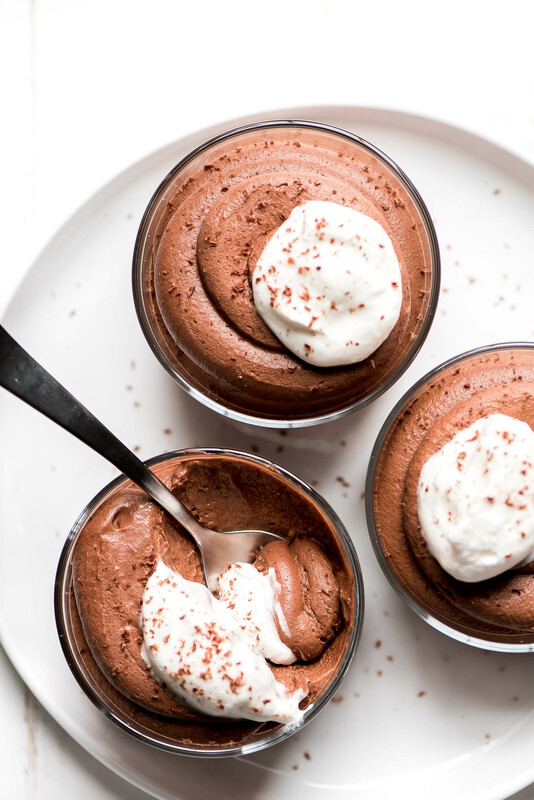 This Easy Chocolate Mousse recipe is the perfect dessert for your next dinner party. It’s ultra smooth, creamy, and will have your guests oohing and aahing. 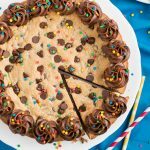 PIN TO YOUR DESSERT RECIPES BOARD TO SAVE IT! I love chocolate and eat it everyday. It’s really its own food group for me. If I have to choose between a chocolate dessert and anything else, I’ll always choose the chocolate. To think that some people are allergic just pains me. 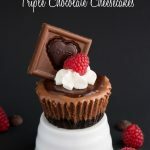 I love chocolate in all forms and this Chocolate Mousse is just divine! 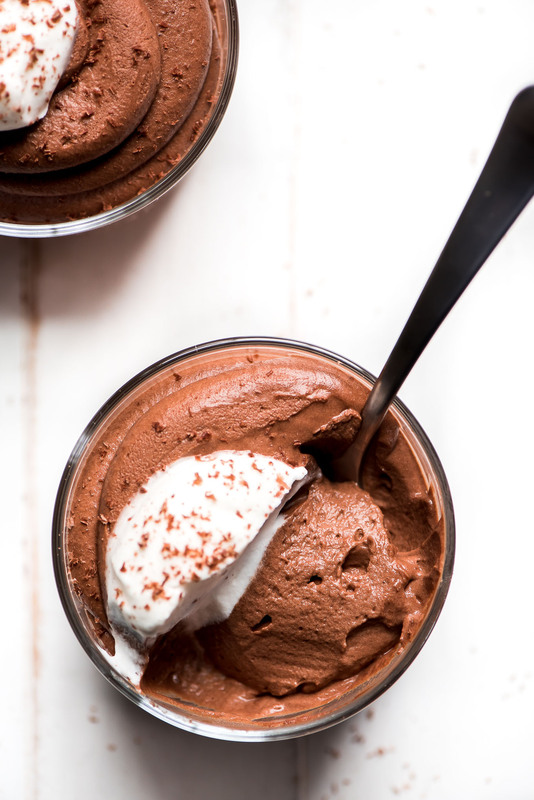 So smooth, airy, creamy… everything you want in a mousse. 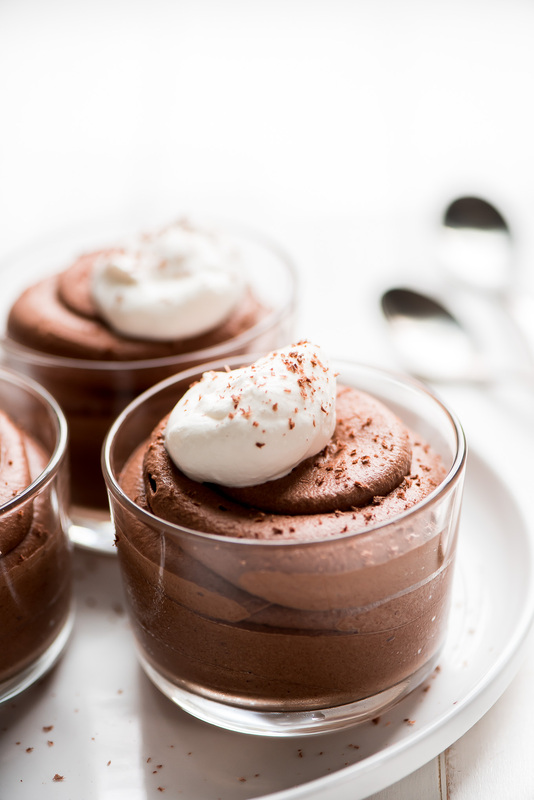 Typically Chocolate Mousse is made with whipped egg whites but the egg whites are NOT cooked. 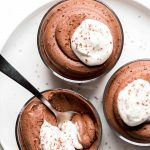 There is a very slight risk of contamination so if you or your dinner guests are pregnant or immune compromised this is the perfect mousse recipes, not to mention it’s freaking delish! TO make it have that same light, fluffy, smooth texture, this recipes uses more whipped cream. This is the perfect dessert for a dinner party because its fancy and sophisticated but is easy and is made ahead of time. 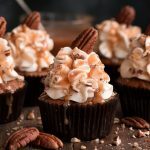 Hosting a dinner can be stressful with having to get the house clean, table set, the dinner ready… it’s really nice to be able to at least make the dessert the day before so you have one less thing to worry about. This recipe is so easy only requiring 5 simple ingredients: egg yolks, sugar, heavy whipping cream, chocolate, and vanilla. The first step is to beat the egg yolks with an electric mixer on high for about 3 minutes until it starts to thicken. Then add in the sugar a little at a time while beating. Meanwhile, you’ll need to heat up a cup of heavy whipping cream in a sauce pan. Once it is hot and you can see steam rising, you’ll stream half of the cream into the yolks while mixing. This tempers the eggs. If you were to add the eggs to the sauce pan you’d likely end up with scrambled eggs. After half of the hot milk is mixed into the yolks, you can then pour that mixture into the sauce pan. Continue to cook the mixture on low for 5 minutes while continuously stirring. The mixture will thicken during this time. Next, you’ll mix in the vanilla extract and add in the chocolate in 3 batches and keep on the element until the mixture is smooth. Pour the mixture into a bowl, cover, and place in the fridge. You need the chocolate mixture to cool to about room temperature. This will take about 1.5-2 hours in the fridge. Just give the mix a stir every 20-30 minutes. Once it is no longer warm you can start whipping the remaining cream to stiff peaks and then fold it into the chocolate mixture. Pipe or spoon the mousse into small glasses or bowls and place in the fridge until ready to serve. Serve as is or top with whipped cream and shaved chocolate. I like to shave my chocolate with a microplane or zester. 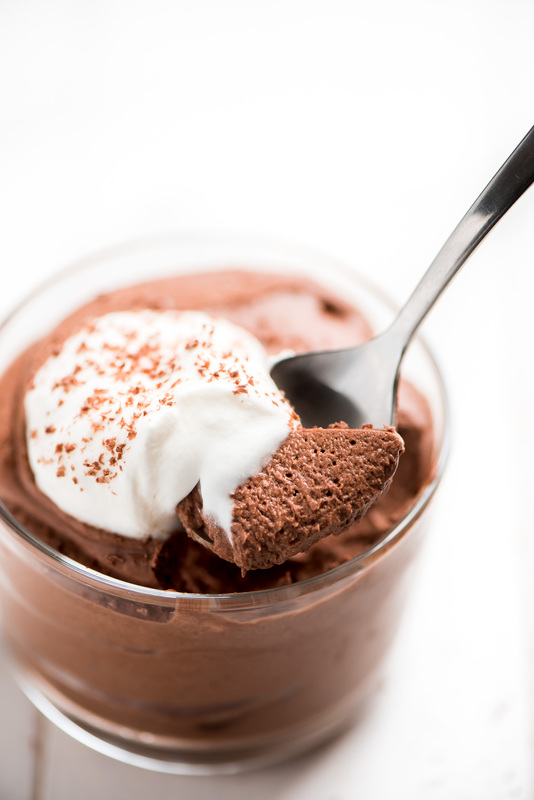 You are going to LOVE this Chocolate Mousse. It’s so smooth and refreshing. The perfect ending to any dinner. Kitchen Aid Mixer– This is so handy to have in the kitchen. I use it for cookies, cakes, frosting, bread, whipped cream… LOVE IT! Microplane Zester– This is great for zesting but also for shaving chocolate or Parmesan cheese. 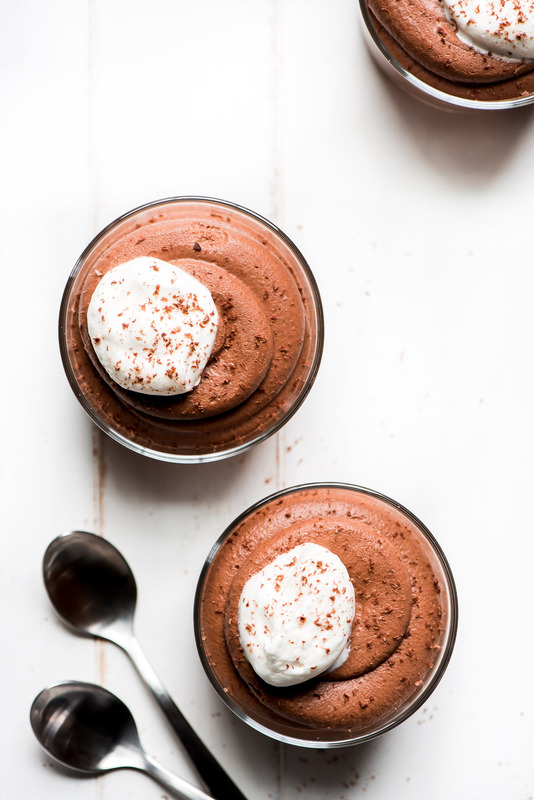 This Easy Chocolate Mousse recipe is the perfect dessert for your next dinner party. It's ultra smooth, creamy, and will have your guests oohing and aahing. Beat egg yolks in the bowl of a stand mixer with the whisk attachment for 3 minutes until thick. Gradually add the sugar while beating. Heat 1 cup of cream in a small sauce pan until hot. With the mixer on, stream 1/2 of the hot cream into the eggs. Once combined, pour the mixture into the pot with the remaining 1/2 cup cream. Turn the heat to low and cook until thick, stirring constantly (5 minutes). Mix in the vanilla and then add in the chocolate in 3 batches, stirring over low heat until melted and smooth. Pour the mix into a large bowl, cover, and place in fridge for 1.5-2 hours, stirring every 20-30 minutes. Once no longer warm, remove from the fridge and whip up the remaining 1 1/2 cups heavy cream to stiff peaks. Fold the cream into the cooled chocolate mixture. Pipe or spoon the mouse into small glasses. Cover and place in fridge until ready to serve. Garnish with fresh whipped cream and shaved chocolate.